Winter weekend in Bright | 15,000kms of Food! My overall impression of Bright is lovely. It was a great drive there, we left early afternoon and arrived in the evening. Given the time of year, it was dark by the time we arrived and it was a bit daunting getting to the house on dark country roads. The house we stayed at was aptly named “Evening Star” as the deck faced the mountainside and stars (which were aplenty). The house was as gorgeous (as was described), with lots of space to relax, a bathtub with views of the mountains and a fully decked out kitchen (which we enjoyed cooking breakfast and dinner a few times). One of the primary reason’s for visiting Bright was to dine at Simone’s (which at the time had 2 hats in the GFG, alas it now only has one). It was charming and rustic, and the food was delicious. Outstanding items include homemade gnocchi with mushrooms and truffle, calamari lightly battered with rocket and the roast pork done 3 ways. We stayed in Bright for a few days. To amuse ourselves, we drove along the Great Alpine Road which is a great drive with very pretty scenery. Another highlight of the trip was the Wandiligong Pub, with great locals and character (look out for a tree out the back with about 30 pairs of bra’s hanging from it!). If you have a few hours, check out the Wandiligong maze – it was a quite a challenge and probably the best maze I’ve ever seen. On the way back to Melbourne we stopped by a few spots. One of which was Milawa, where there was a local Sunday market. There was nothing terribly exciting at the market but the shops were interesting with cheese and mustard aplenty! 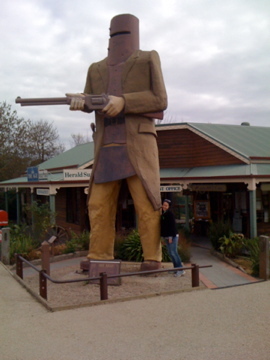 Another pit stop on the way home was Glenrowan where the giant Ned Kelly resides. It was like a cowboy town with a row of shops (every single one with reference to Ned) running through it and a giant statue. Overall, the trip was great and I can’t wait to return to that region! Next time I’ll be hitting up Beechworth. I notice that you neglected to mention a certain deer sighting!! !